Do you hear a clicking or popping sound when you open and close your mouth? 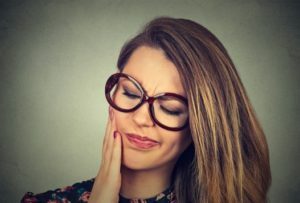 You could be suffering from a condition that affects the temporomandibular joint, which connects the jaw to the skull on either side of the face. Sometimes, it may function incorrectly, leading to many painful and uncomfortable symptoms. This is known as a TMJ disorder, which affects as much as 12% of adults. To stop the pain, your dentist in Canton, Dr. J.D. Robinson, offers treatment for TMJ. Now, you can improve your quality of life and jaw function with a proactive treatment plan. A TMJ disorder can develop due to several reasons, such as past injury or trauma to the joint. However, it can also be the result of skeletal issues or arthritis. Most often, it can be caused by an additional underlying issue, such as a poorly aligned bite or bruxism, which causes grinding and clenching of the teeth. Due to the added strain and pressure placed on the joint, it can cause the jaw to become painful and function poorly. What are the Signs of a TMJ Disorder? The symptoms of the disorder can be quite diverse. Most often, the joint is painful and tender, while swelling can also develop. It is not unusual to hear or feel a clicking, popping, or grinding sensation when opening and closing your mouth. In some cases, the jaw may even lock into an opened or closed position. While these are uncomfortable, you may also experience complications of the disorder elsewhere other than just the jaw. An untreated TMJ disorder can cause you to develop tooth sensitivity and even loose teeth from the pressure of clenching the jaw. You may even suffer from head, neck, or shoulder pain. Headaches can also occur while others experience ear pain or ringing in the ears. The diversity of symptoms can significantly decrease your quality of life as everyday tasks, like chewing, speaking, and yawning become more difficult. You can stop the discomfort with treatment from Dr. Robinson. The symptoms of the disorder often flare due to stress, strain, and pressure on the joint. To alleviate the complications, stress-reducing exercises can help, as well as exercises to improve the flexibility of the jaw. In addition to these home remedies, an oral appliance if often beneficial. This custom-fit device is similar to a mouthguard; however, it repositions the jaw into a more comfortable and natural position. This takes pressure off the joint while also protecting your teeth from grinding and clenching. In some cases, orthodontic treatments may be recommended to realign your bite. Where Can I Get Treatment for My TMJ Disorder? If you are ready to improve your quality of life, you can stop the pain by calling Robinson Dental Group. Dr. Robinson will find the underlying cause of your disorder to create an effective treatment plan. Contact our office today to schedule your consultation.